Madrid, while being one of the most beautiful cities in Europe, is decidedly landlocked. In fact, it's over 300 kilometers, or nearly 200 miles, from the sea. But that doesn't mean you don't have a few options for a visit to the beach during your stay in Madrid if you're willing to do a little bit of travel and get creative. Thanks to the high-speed AVE train, the nearest beach to Madrid is in Valencia, Spain's third-largest city and a verifiable Mediterranean metropolis. You can get there by train from Madrid an hour and 40 minutes, then take a taxi to the city beach. It's expensive, but it's not an impossible day trip from Madrid. If you catch the earliest possible AVE train from Madrid (which usually leaves around 8 a.m. or shortly after), you can be in Valencia and on the beach by midmorning. Valencia itself also serves as a great home base if more fun in the sun is on your agenda. The city is well connected to plenty of other beach destinations nearby. To really take advantage of your summer, consider a longer stay in Valencia so you can take a day trip or two from there. A great option nearby is Alicante, which perfectly blends an exciting city vibe with the feel of a laid-back coastal town. If your itinerary and budget allow, you can also hop on the AVE in Madrid and head for Catalonia. The AVE also reaches the northeast of Spain, so you can get to Barcelona in three hours and Tarragona in two and a half. Both are home to some of the country's best city beaches. Barcelona in particular makes a great base for discovering the region's pristine playas, while Tarragona is a great option if you'd like a side of history and culture with your sun and sand (it's one of Spain's foremost destinations for Roman ruins). 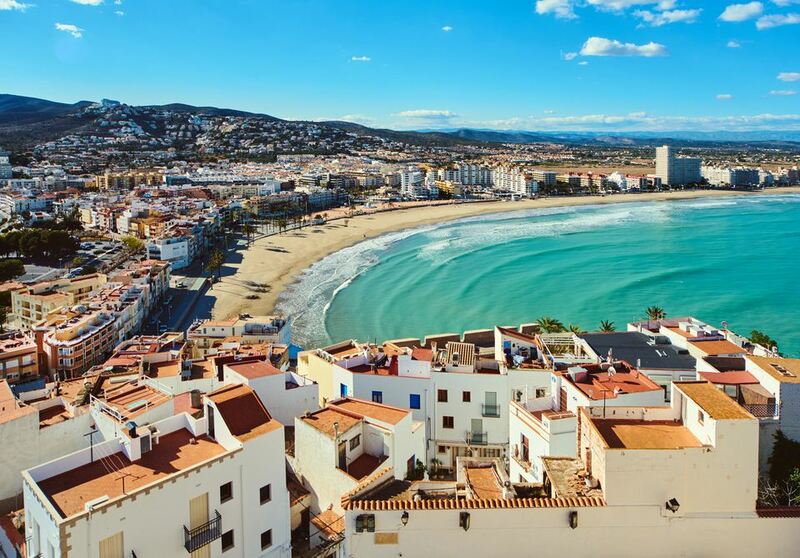 While it'll likely set you back more than a hundred euros, the AVE train also serves Malaga, making it easy to visit the Costa del Sol from Madrid. If the magic and passion of Andalusia is calling your name, this is your best bet. You can get to Malaga from Madrid in less than three hours, then either stay there or visit one of the beaches in a nearby town via the Cercanías commuter train. Believe it or not, there's a cute little beach within an hour of Madrid itself. While Alberche Beach isn't located on the sea itself, it teems with so much coastal, tropical charm that you'll almost forget you're at the junction of the Alberche and Perales rivers. Locals flock here on weekends to enjoy fun in the sun close to home—you can rent boats, have a picnic, and perfect your backstroke all just a hop, skip and a jump away from the city. Sound good? Your best bet for reaching Alberche Beach is to rent a car, but that may not be an option for everyone. If it's not, bus 551 from Príncipe Pío also serves the area. Madrid Rio is the newest recreational development in Madrid, complete with sports facilities, skate parks, a whopping 17 children's play areas (making it extremely family-friendly), and even an urban beach (more on that in a bit). The 10-kilometer-long park runs on the banks of the Manzanares River and additionally boasts concert venues, a new cultural center, and over 26,000 trees. The Madrid Beach is an urban beach area located within Madrid Rio Park between two bridges: Puente de Toledo and Puente de Praga. It transforms into an ice-skating rink, but in the summer, locals and tourists are encouraged to take a swim and get their tan on. The nearest metro station is Pirámides, but several other stations—including Príncipe Pío, Puerta del Ángel, Marqués de Vadillo, Legazpi, and Almendrales—also provide easy access to the park. What's the Quickest Way to Get Between Madrid and Barcelona?